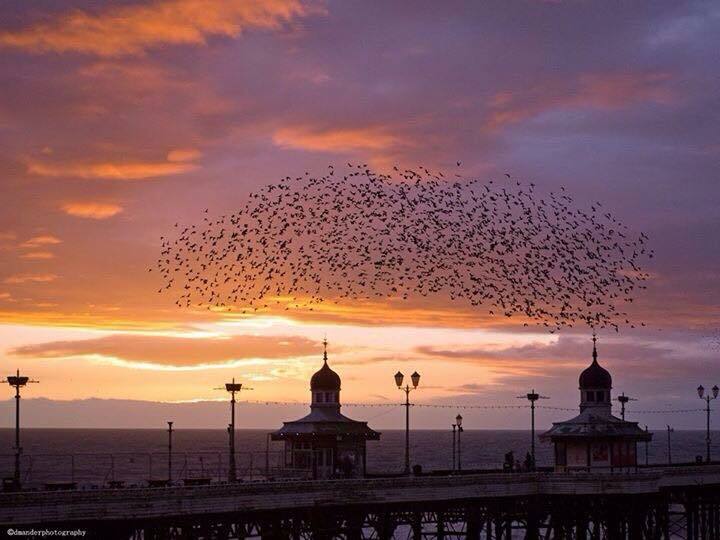 Have you seen the clouds of starlings on Blackpool Piers, the Tower and the beach? 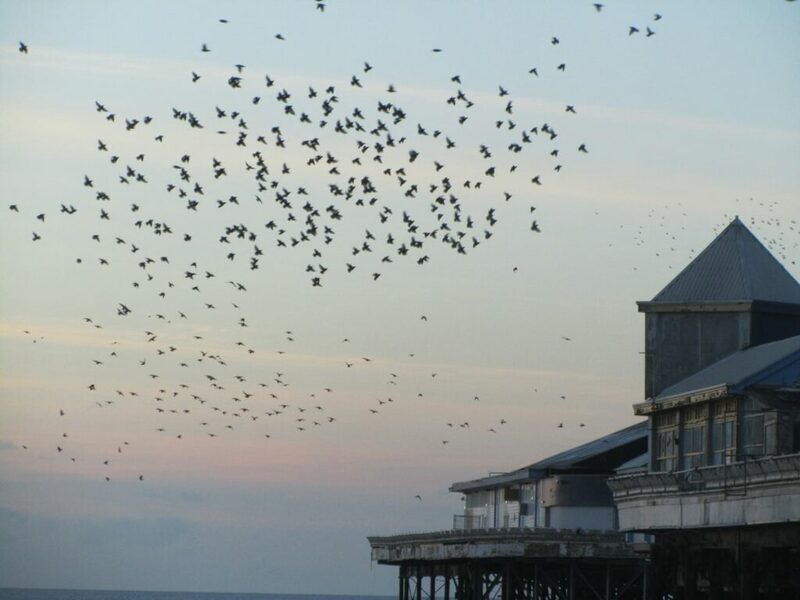 In the cold months of winter they gather at dusk every day to roost on the buildings of Blackpool seafront. This beautiful photo of them at sunset (below) was taken by Visit Fylde Coast contributor Dawn Mander. 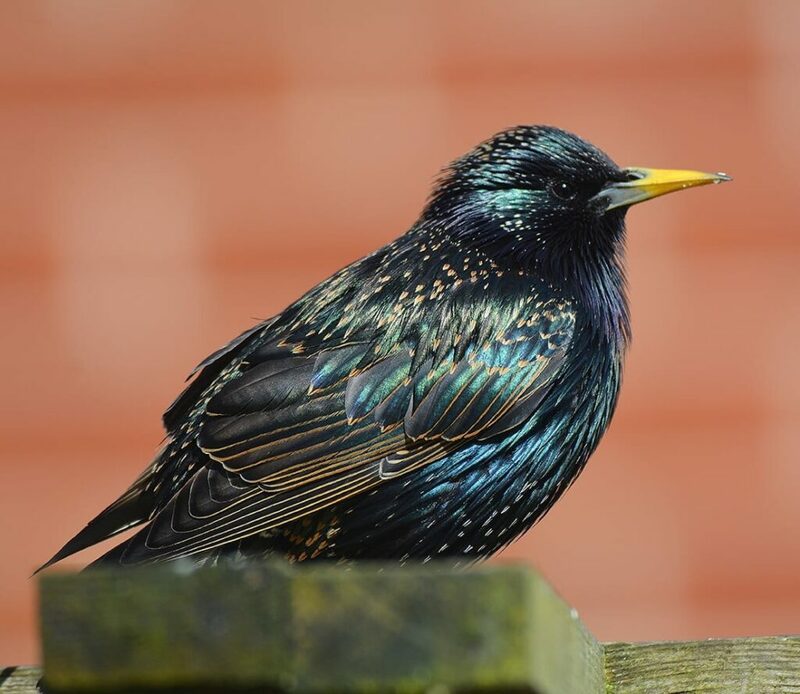 The Starling is a notoriously cheeky British bird – daring and brave he lives alongside man in our gardens and public places. The birds perform stunning aerial acrobatics, swooping and diving as if one solid, black radio-controlled mass. First they land on the beach, then North Pier, then Central Pier. They might also land as a single mass on one of the other buildings along the seafront. Eventually as it goes dark the birds land where they will roost for the night. The starlings usually spend the night gathered together in large numbers for warmth and safety on the piers. 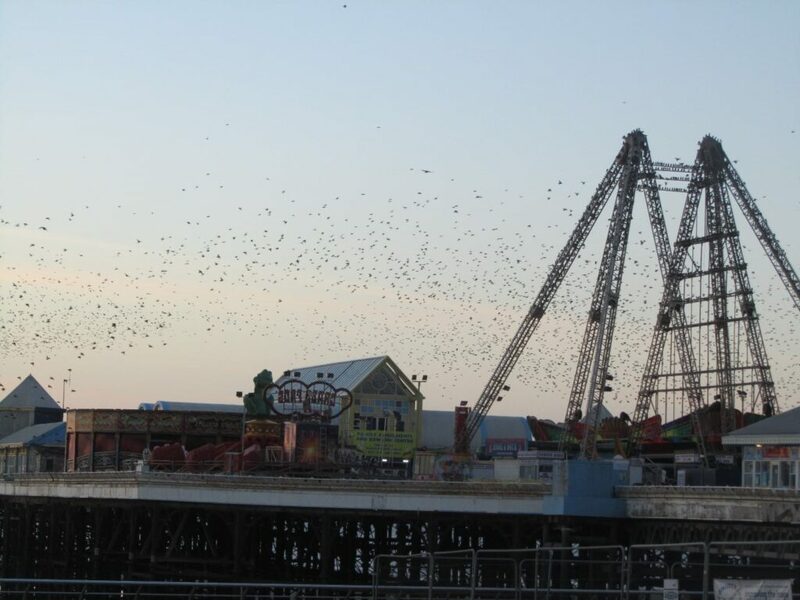 Where are the Starlings on Blackpool Piers from? Some of these starlings are Sandgrown and, native to Blackpool, they live here all year round. Their numbers swell when they are joined by migratory Starlings that overwinter in our milder weather. They mainly fly in from Scandinavia. 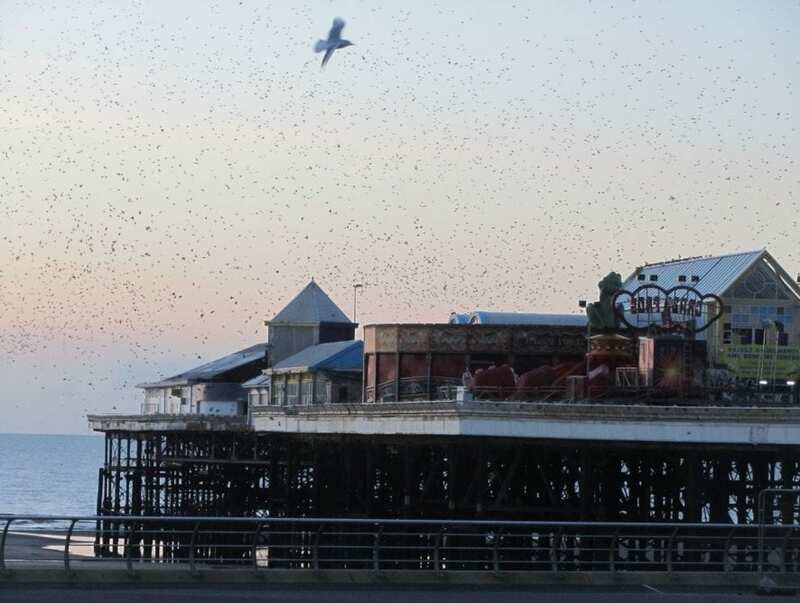 That’s how we end up with such huge numbers of starlings on Blackpool piers in winter. The proper name for this avian display of starlings in flight is a ‘murmuration’. Blackpool seafront and the piers is one of just a few places in the UK where you can see such this display of roosting starlings. They also flock in huge numbers at nearby Marton Mere. The best time to see the Starling displays is when they start to return to Blackpool from about September. Most of the migratory birds are here by October. You’ll be able to see them through November, December, January and February. By early Spring time they’ll have nesting on their minds. The migratory visitors start to return to their breeding grounds from the end of February. Sometime in March they will have gone, until they return again the following Autumn. The Starlings future is not as bright as it once might have been. 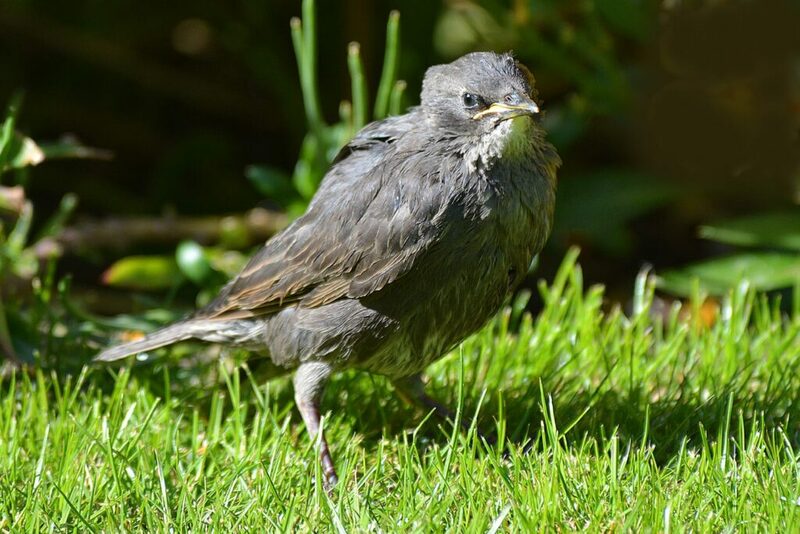 The annual RSPB Big Garden Birdwatch has revealed that Starling numbers have declined by a huge 80% in the 30 years that they’ve been conducting the survey and collecting results. Only 15% of juvenile birds make it to the end of their first year of life. The ones who are lucky enough to make it to breeding age can expect to survive for two to three more years. If they were safe, they could expect to live to about 20 years of age. 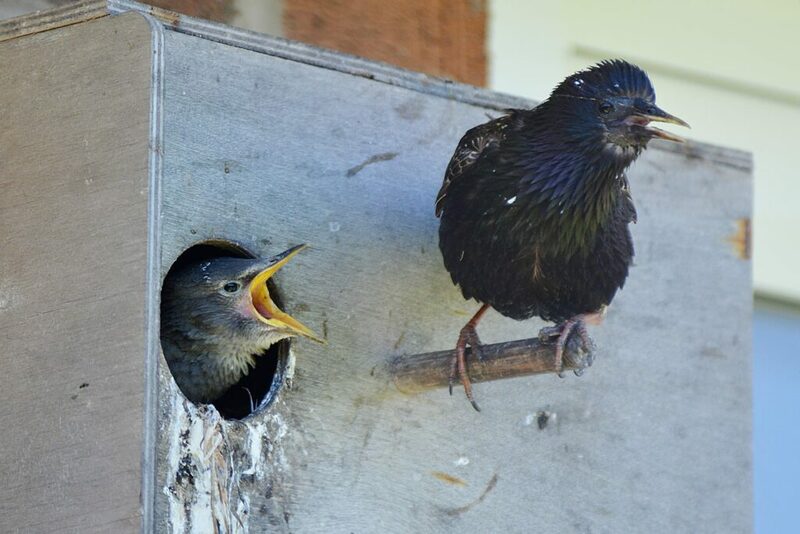 Starlings breeding in our own garden in a parrot nesting box! Although it’s still one of the commonest of garden birds, its decline elsewhere makes it a Red List species of high conservation concern. So the clouds of birds which roost on our piers are even more important than they might seem. 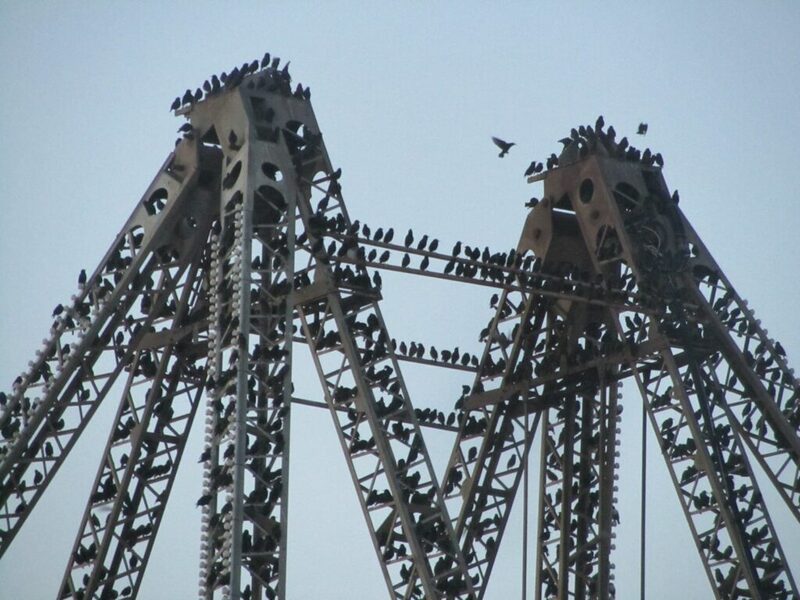 Starlings gathering on the Big Wheel frame while it was being maintained.